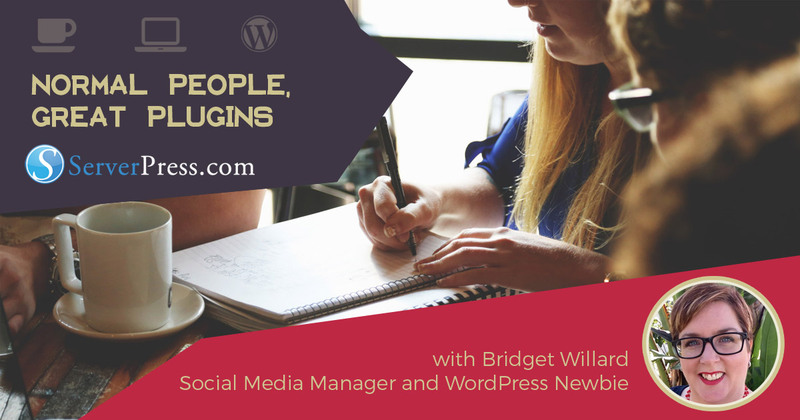 “Normal People, Great Plugins” is an article series focused on reviewing really useful plugins and resources available to you to build out your WordPress website. Bridget brings her wit and unique perspective of being a beginning user of WordPress to talk about how user-friendly the plugins are. If you are just getting started with WordPress and looking for high-quality and user-friendly solutions, then you’ll love this series. You know that one friend. We all have one. When we’re with them we feel 50 pounds lighter, 20 years younger, and 10 IQ points smarter. That friend has a way of boosting our confidence until we become the person she thinks we are. I’d like to introduce you to my new BFF, DesktopServer. Well, just kidding, but not really. Like any good friend, they give you courage to try. That’s the one thing I’ll always be grateful for. I never would have even tried to build a WordPress site without DesktopServer. I know, I get excited and talk (and blog) fast. I bet you’re wondering what DesktopServer is and what it does. DesktopSever is a program that is installed on your computer’s hard drive (they call this installing locally). It contains all of the necessary languages and database structures (PHP, MySQL, and WordPress) so that you can build, export, and/or copy a WordPress site without being online or signing up for hosting. This allows seasoned developers to test themes and plugins without “cowboy coding,” which is what they call testing on a live site. It also gives new WordPress users the security of knowing that they can try WordPress without breaking the interwebs. 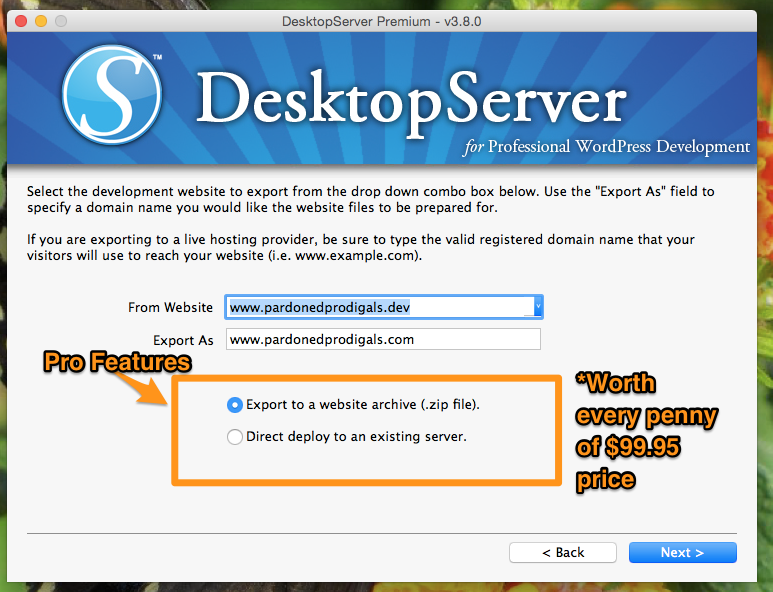 DesktopServer is offered at two tiers: Limited (Free), and Pro ($99). Is Pro worth $99? Yes! Especially if you’re new like me. The Pro version allows you to push your local site live. Honestly, I don’t know how you’d publish the site publicly without it. Yes, I’m that new. Once you choose the domain name, and DesktopServer is done doing it’s thing, it will direct you to yourdomainname.dev in your browser. You log in, just like you would on any WordPress site with your username and password. All of the building and site viewing is then done inside of your browser. It feels real. But then, you need to deploy it. Once you’re ready to publish your site (deploy), you’ll be glad for every red cent you sent to ServerPress. In all of the years I’ve been using various programs, I’ve never had a better experience with their customer support. Recently, I used DesktopServer for the second time to import an existing WordPress(dot)com site and then tweak it for our non-profit, Pardoned Prodigals. Once I was done building the site, it took about 15 minutes to deploy the site. This speed may change depending on the size of your site and the bandwidth of your internet service provider. Let me continue to rave about my new BFF. With friends you have to remember certain details about their lives and previous conversations. If you don’t, your BFF may throw a half-calf double-whip latte in your lap. DesktopServer expects you to know the passwords to your hosting site as well as your new username and password for your Dev site (that’s totes, BFF-speak for development). Sometimes lingo can be tricky but just like with any friendship, you get to know each other with time. Your new bestie would help you pack up your apartment and move into your new digs, right? DesktopServer helps you, too. I bet you were wondering why this was part of the series on plugins, right? DesktopServer is a program that has a WordPress plugin. After you setup WordPress on your host, login. Find, install, and activate the DesktopServer plugin. This is needed in order to for DesktopServer to communicate with your live site. It’s the easiest move, ever. No BFF worth her salt would ever let you wear orange when your complexion clearly puts you in summer. After all, you’d clash with yourself. And don’t even think she’ll let you go to a party wearing sneakers when you should find the best heels ever. DesktopSever gives you the opportunity to experiment with plugins and how they work together, just like assembling the perfect outfit. There’s no judgement, just a positive, open learning environment. But it’s better to experiment with your friend than to show up live. Nothing’s worse than a friend who only wants to be with you during the sunshine and not the rain. If you have the Pro version of DesktopServer, they may help you get your website published. They call this assisted deploy but we bloggers know what publish means. DesktopServer isn’t just a friend when your toddlers want playdates. She’s more than that. Like a friendship that grows and matures over time, DS meets you where you are. And this is one of the most impressive parts of this tool. Whether you’re a seasoned developer or a n00b, DesktopServer is your new best friend. Both developers and new people like me use DesktopServer. Beginners need a safe place to try. Developers need an experimental safety net, too. The free version is great but the pro is the best $99 you ever spent. Trust me. I’ve experienced it. But if you’re a faithful WordImpress and “Great Plugins, Normal People” reader, then use the code wordimpress at checkout and you’ll be paying a cool $79 instead. 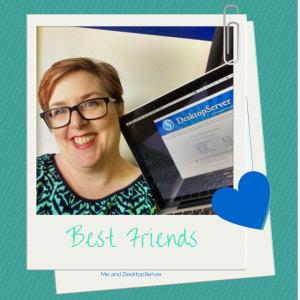 This is why DesktopServer should be your first and only true friend in your WordPress journey. You’ll take her everywhere you go, and maybe even out for a day of fun.